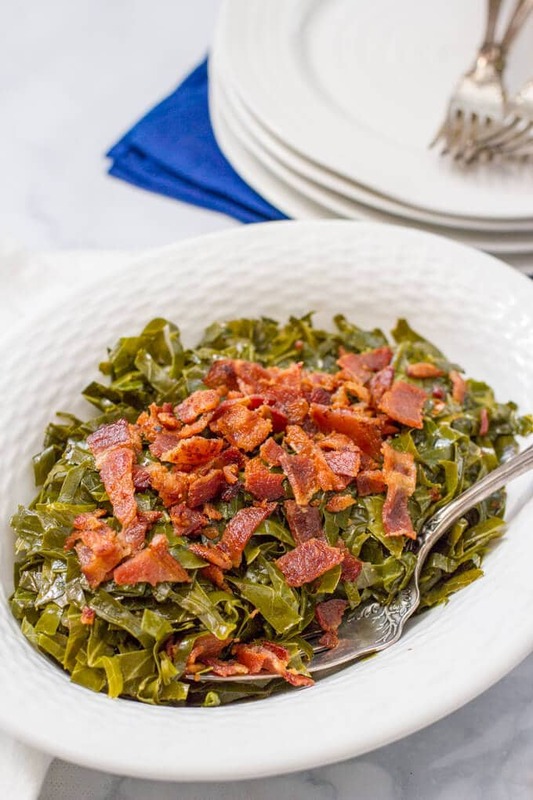 Quick Southern collard greens with bacon have all the great flavor of traditional collards in a fraction of the time for a delicious, easy side dish! Hiya friends! How was your weekend? Did you do anything fun? Get your Christmas shopping done? I’m close to done after a morning spent running around on Saturday. The traffic, the lines, the loads of shopping bags – must be the holidays! But now on to the food… I’m bringing you guys ALL kinds of Southern goodness this month. 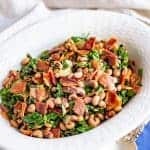 Today’s it’s my quick Southern collard greens with bacon, later this week I’ve got an old Southern breakfast favorite and we’ll wrap up December with some classic Southern dishes that are perfect for New Years Day. 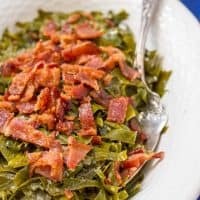 Collard greens are included in that… they are a Southern staple on New Years Day, eaten to ensure prosperity (i.e., money — the green connection) in the coming year. But I just flat out love them any time of year! I remember my mom making these in our old house out on the screened-in porch. She didn’t want them stinking up the house during the HOURS of cooking they take. 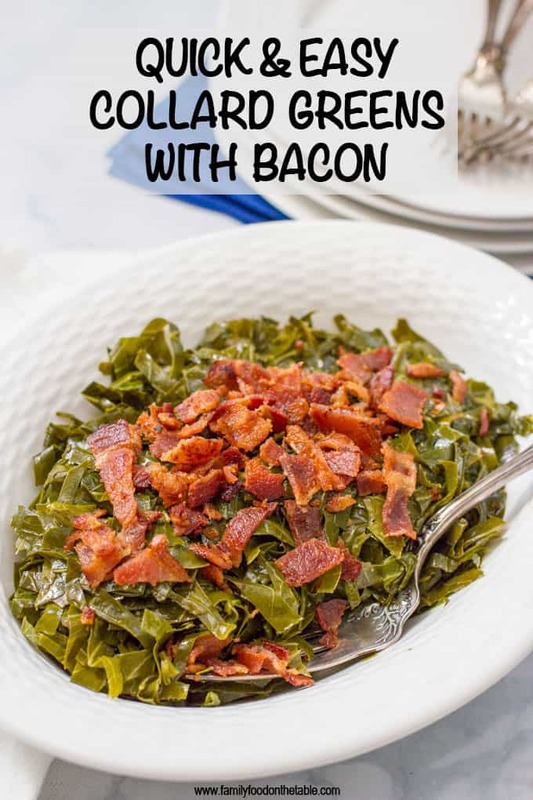 I love collard greens — and especially when they’re paired with a bit of bacon — but I don’t got that kind of time. Or energy. So I’ve played with this faster version and guys, my Southern soul would like to tell you that these are every bit as good as the classic! 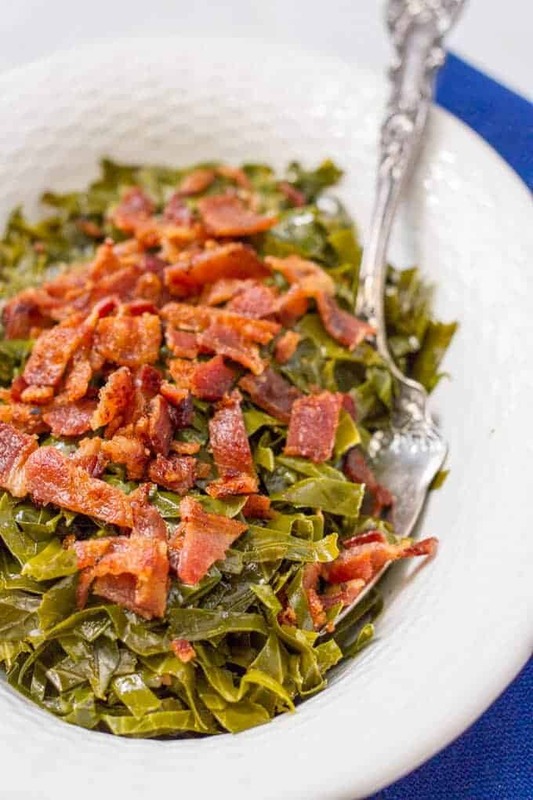 The one caveat: These quick Southern collard greens use bacon grease and bacon as the fat and extra flavor. So if you are a ham hock or ham bone type of person for your collards, this might not do it for you. 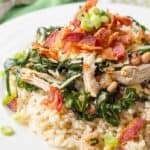 But for me, to get that bit of pork flavor, that collard green goodness and a bit of tanginess from the vinegar — AND to have it ready in under 45 minutes? That’s a total win. 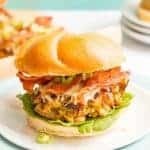 I use 3 slices of bacon, cut in half, because that’s about all that will fit in the pot I use to make these. If you have extra room, feel free to use more bacon. I prefer thick-cut bacon, but you can use your favorite. I wash and thinly slice the collards while the bacon is cooking to keep the prep time down. Don’t skip the vinegar at the end. 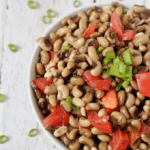 It gives a hit of tangy freshness and really competes the dish. 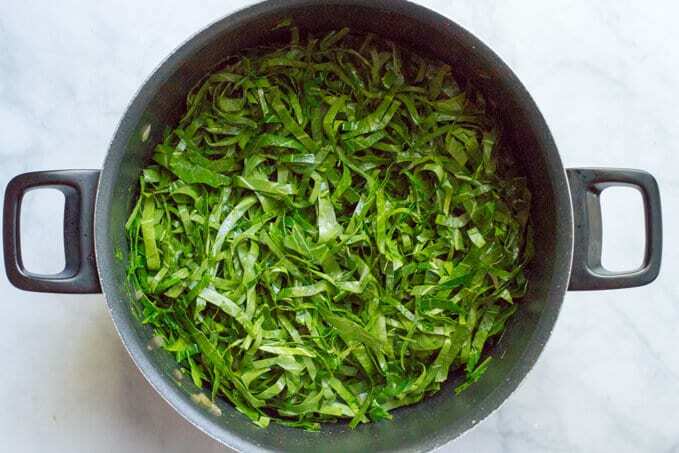 Having the collards sliced up so thinly is the trick to this fast version of collard greens. They cook up, break down and get tender more quickly sliced this way. And they absorb ALL the great bacon and vinegar flavors! 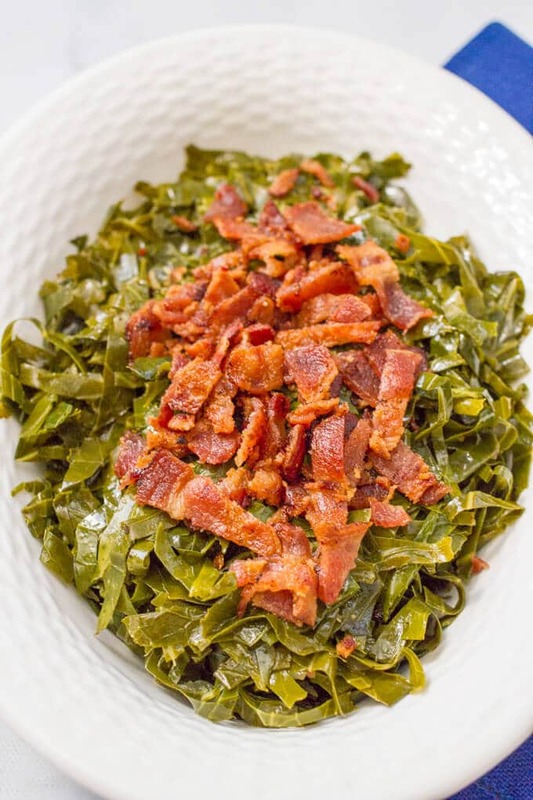 And I seriously adore the tender collard greens topped with the crispy, reserved bacon. The perfect contrast! 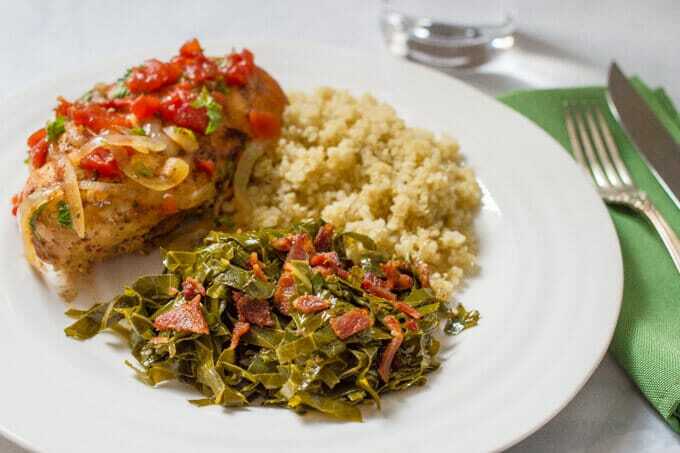 So trust me, there’s no need to cook your collard greens all day long. You can slice them, saute them and have them ready to serve for dinner in well under an hour. Check out my newest VIDEO to see how easy these are to make! Saute onion in bacon grease over medium heat until tender, about 2 minutes. Add sliced collard greens (see notes) and toss to coat in the grease. Season with salt and pepper and stir to combine. 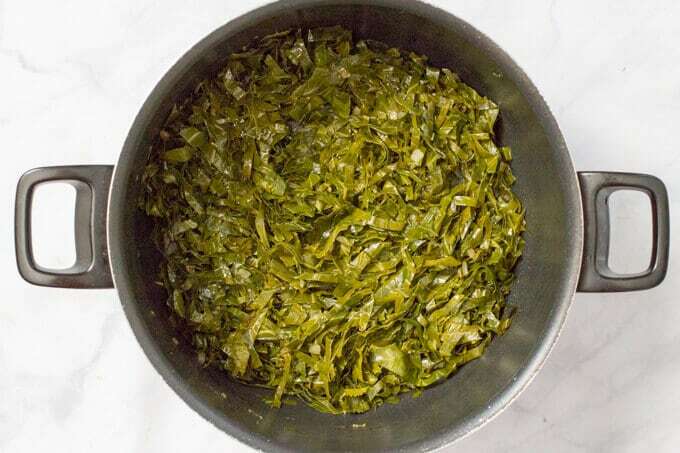 Once the collard greens are tender, drain any excess liquid. Add apple cider vinegar, stir to combine and simmer for 2 minutes on medium low. 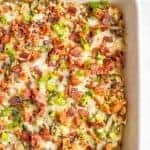 Serve hot with reserved, crumbled bacon on top. I use 3 slices of bacon, cut in half, because that’s about all that will fit in the pot I use to make these. If you have extra room, feel free to use more bacon. I also prefer thick-cut bacon, but you can use your favorite. I wash and thinly slice the collards while the bacon is cooking. 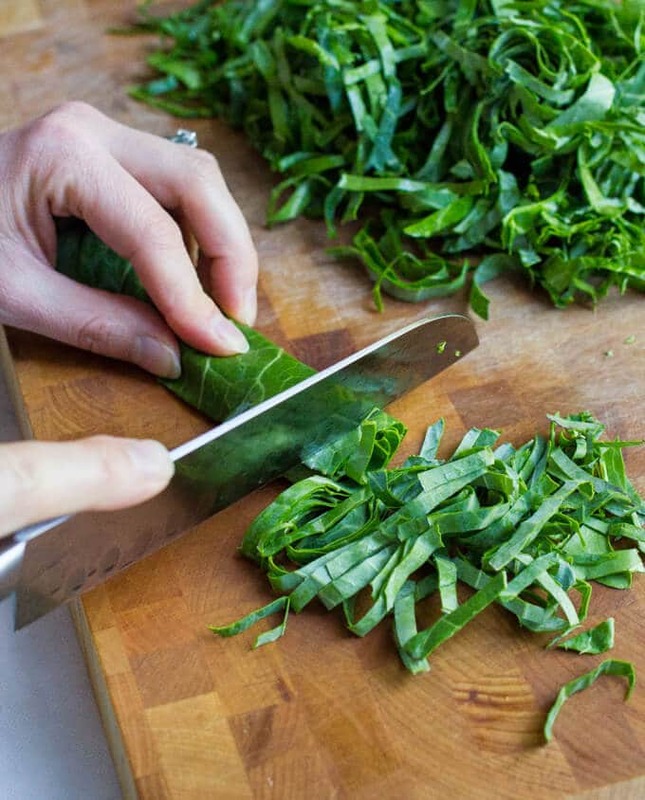 To prep your collard greens, remove the hard inner stem from each leaf and roll up the long strips of collard green leaves into a tight roll. Slice thinly — this is called a julienne cut — and they’re ready to go. I had a very busy and productive weekend, but none of it was spent on holiday stuff. Oops?? Lol. Glad you got a lot done and the Symphony sounds like a wonderful date!!! So, I didn’t grow up eating collard greens, but MOD (my other dad) straight up LOVES them! He is coming to visit for NYE and I’m thinking I MUST have these on the menu! Love that you cooked them in bacon fat!! Yumm YUM!! Cheers, friend! Absolutely! I think you’ll love them Tara! I love how southern this is! Looks great! Love the bacon!!! 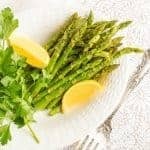 Looks like such a quick and delicious dish! Absolutely it is! Thanks Lindsay! What a great idea for the holidays! Looks great for a wonderful dinner! It’s a favorite side here!